… why say them? I shouldn’t be too flippant about art or visitors to the Jakartass Galleri may make disparaging remarks about my artistic legacy to the nation. Like most of my readers, “I know what I like”. A gaggle of art critics trying to render visual pleasantries in abstruse analyses made impenetrable through a dip into a thesaurus are not, for me, part of the bigger picture. We art lovers prefer comics and cartoons. ‘Keep it simple, stupid’ is my motto. So the chance for visitors to Tate Britain in the Tate Gallery, or to the gallery’s website, to write their own label for any painting on display was too good to miss. All the following labels needed was the common touch and just a little editing (my italics). As you all know, Jakartass is nothing if not common. Gilman was a member of the Camden Town group of artists who painted images of urban life. This work was painted from a detailed drawing made on the spot during a family visit to Leeds. 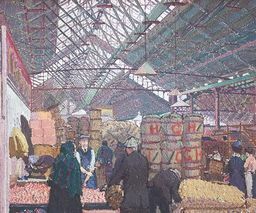 The vibrant, working-class life of the market provided subject matter for several Camden Town painters and their wives. They were influenced by the Impressionists and their followers such as Van Gogh, Van der Plus and Gucci. This can be seen here in the strong colours and use of small, regular brushmarks. These give the painting a tight structure which is complemented by the housewives in the foreground haggling over the price of onions and carefully counting their pennies. William Tucker said the essential quality of sculpture was ‘visibility’. By this he meant not simply that a work could be seen, but that it should actively seek to ‘meet, attract and hold our sight’. In order to achieve this, Tucker combined apparent simplicity with a complexity that was only gradually revealed, generally in the morning after. 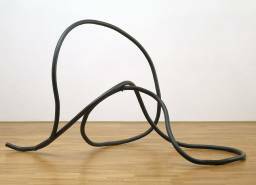 In the 1970s, his works were described as ‘impossible objects’, since they were extremely difficult to hold accurately in the memory despite their simplicity. Beulah i is a reminder of the temporary nature of a magnum of Dom Perignon. Viewers are made aware of their own perceptual efforts to understand the form and structure of the night before. And here’s some nice painted rocks which require no words.